CLARKSBURG, W.Va. — ESPN analyst and former NFL head coach, Herm Edwards, has been named the keynote speaker at the 36th annual Big Green Dinner. The event, presented by the Francis Charitable Foundation, will be held on Friday, April 25.at 7 p.m. in the Henderson Center located in Clarksburg, W.Va. Individual tickets for the event are $80 and VIP reception/table sponsorships are $2,000. Photo shows former NFL head coach and current NFL analyst for ESPN Herm Edwards delivering a motivational speech In August 2013 to the University of Alabama football team. Edwards will be introduced by Marshall legend Chad Pennington, who played quarterback for the coach as a member of the New York Jets. The event will honor Marshall student-athletes at the dinner. 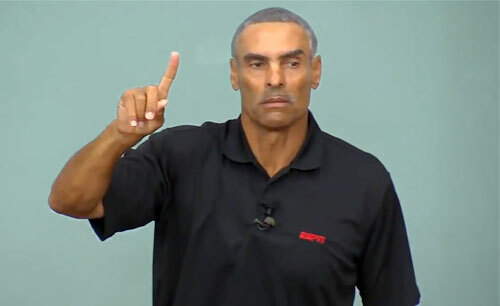 Watch Herm Edwards deliver motivational speech to the University of Alabama football team. Edwards is the former coach of the New York Jets who recently coached the Kansas City Chiefs. He played cornerback for ten seasons (1977–1986) with the Philadelphia Eagles, Los Angeles Rams and Atlanta Falcons. Prior to his coaching career, Edwards was known best as the player who recovered a fumble by New York Giants quarterback Joe Pisarcik on a play that has been dubbed as “The Miracle at the Meadowlands.” He is currently an NFL analyst for ESPN. If you would like to book athletes or sports speakers like Herm Edwards for an event, contact Herm Edwards’s booking agent for appearance & speaker fees or call 1.855.303.5450.